Guava (Psidium guajava) is a tropical fruit born off shallow rooted evergreen, small trees or shrubs. Sensitive to cold temperatures, guavas thrive in both humid and dry climates. In the right climate, USDA zone 10, guavas can bear copious quantities of fruit but knowing when to harvest guava can be the tricky part. How do you know when guava fruit is ripe and how do you harvest guava fruit? Read on to learn more. When is Guava Fruit Ripe? Guava will begin to fruit in its second to fourth year. When conditions are right, a single tree can produce from 50-80 pounds of fruit per year. In Florida, guava trees may even produce twice a year; and with proper pruning, you can even get a guava to produce year round. That’s a lot of guavas, so knowing when to harvest guava is imperative lest you lose the delicious fruit. Large guavas can go from hard and sour to mush in short order. 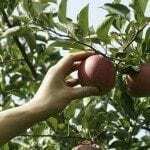 If picked before the fruit is ripe, it will not ripen well, but if allowed to mature on the tree, the crop can be decimated by fruit flies. Because guavas can fruit and ripen year round in warm climates, where they are growing anyway, an exact time is not an adequate gauge for guava harvest season. There are other indicators, however, that will allow clue you into the correct time for harvesting guava. Since there is no specific guava harvest season, how do you know when to pick the fruit? As with most fruit, color change is a major indicator of maturity. Generally, red or pink guava is picked when the peel turns from light green to yellow. The fruit is then allowed to ripen further in an area of room temp. White guava is picked when full sized and green to light green. It is eaten before it is ripe, when the peel is yellow and the fruit is soft. Another clue as to harvesting guava is the smell. The aroma should reach your nose, not your nose reach the aroma. That is, the fruit should begin to become so aromatic that you should smell the sweet, musky fragrance as you approach the tree. Also, prior to harvesting guavas, feel the fruit. It should give slightly under gentle pressure. You can hasten the ripening of guava by placing it in a paper bag along with a banana or apple and letting the ethylene gas do its thing. A ripe guava can be stored in the refrigerator for 5-7 days. Mature, green guava can be stored for 2-4 weeks in a cool moist area; that is, with a temperature of between 45-50 degrees F. (7-10 C.) and humidity from 80-95%. Use your guavas fresh or add them to desserts, juice them or add them to smoothies. Guava is a terrific source of Vitamin C. Oh, and the last word on guavas. If you buy them from the grocers, they may be treated with an edible wax. If you want to hasten ripening, wash the fruit with cool tap water to remove the wax.